– Hypertext is text that is displayed on a computer display or other electronic devices with references (hyperlinks) to other text which the reader can immediately access, or where text can be revealed progressively at multiple levels of detail (also called StretchText). 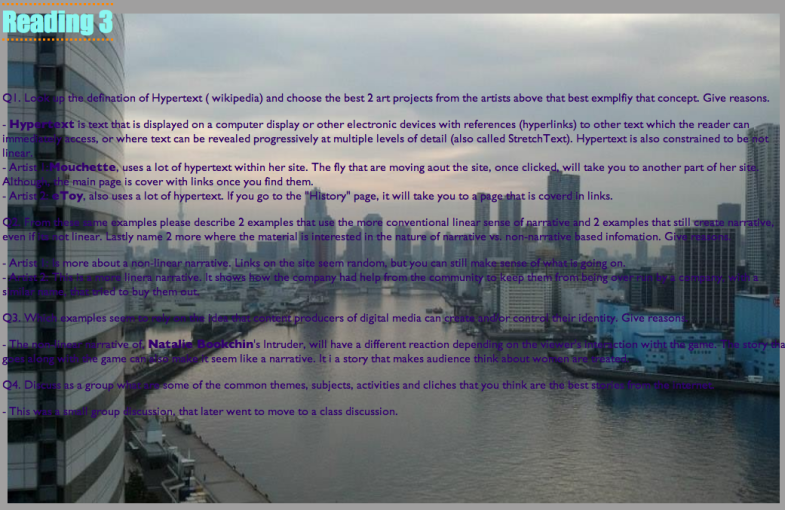 Hypertext is also constrained to be not linear. – Artist 1: Mouchette, uses a lot of hypertext within her site. The fly that are moving aout the site, once clicked, will take you to another part of her site. Although, the main page is cover with links once you find them. – Artist 2: eToy, also uses a lot of hypertext. If you go to the “History” page, it will take you to a page that is coverd in links. Q2. From these same examples please describe 2 examples that use the more conventional linear sense of narrative and 2 examples that still create narrative, even if its not linear. Lastly name 2 more where the material is interested in the nature of narrative vs. non-narrative based infomation. Give reasons. – Artist 1: Is more about a non-linear narrative. Links on the site seem random, but you can still make sense of what is going on. – Artist 2: This is a more linera narrative. It shows how the company had help from the community to keep them from being over run by a company, with a similar name, that tried to buy them out. Q3. Which examples seem to rely on the idea that content producers of digital media can create and/or control their identity. Give reasons. – The non-linear narrative of, Natalie Bookchin‘s Intruder, will have a different reaction depending on the viewer’s interaction witht the game. The story that goes along with the game can also make it seem like a narrative. It i a story that makes audience think about women are treated. Q4. Discuss as a group what are some of the common themes, subjects, activities and cliches that you think are the best stories from the internet. – This was a small group discussion, that later went to move to a class discussion.